There are two types of running backs: those who get the ball and dance around in the backfield waiting for a bit of daylight so they can slide through unscathed, and those who take the ball and go busting into the defense, making a path by brute force. Jim Brown was the second kind of running back. Let’s get this clear from the break: Whether on the field or anywhere else in life, Jim Brown doesn’t dance for anybody. Kobe Bryant dances on the court. He shimmies past defenders, glides through the air and two-steps his crossovers to leave defenders in his wake. But don’t get it twisted—just because Bryant moves gracefully on the court doesn’t mean he’s backing down from anybody. The crux of the problem—about which all would agree—is this: The black community, especially the black male community, is in trouble. What’s undecided is how do we get better. Run straight up the middle or dance around the sides, what’s clear is that both sides want to gain yards. What’s at odds is more a matter of style. Brown’s statements about Kobe earlier this week weren’t shocking for a man who has always taken athletes to task. On The Arsenio Hall Show, Brown made it clear that he doesn’t consider Kobe to be a socially conscious black man. 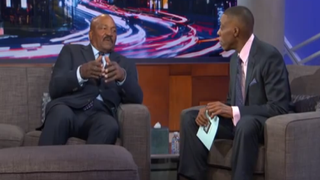 Jim Brown is old school—from his walk to his unrelenting focus on youths in the community. He is what many black men aspired to be before heroin and prison and success came and ravaged their sense of accountability. He believes that to be a world-renowned athlete who doesn’t contribute to the community or the conversation about being a better black man is to waste one’s athletic gifts. Because for Brown it is bigger than sports, and always has been. The part that is more telling has been Bryant’s reaction. Instead of privately bashing Brown for his comments, Bryant took to Twitter to further the conversation: “A ‘Global’ African American is an inferior shade to ‘American’ African Americans?? #hmm .. ,” he wrote. The question is a good one, and one that hasn’t been hashed out in the African-American community: If your black experience is a global experience, does that mean you have less of a connection to the plight of the African American? If you are not a baby of the civil rights struggle, does your black experience matter? Columnist Stephen A. Smith thinks that Brown’s comments were way out of line. Smith cites the expanding community of African-American thought and says that Brown’s calling out of Bryant for being different ostracizes him from a community that he belongs to by birthright. He also notes the inability of the mostly left-leaning black community to embrace black conservatives as an example of how comments like Brown’s don’t bring us together but actually tear us apart. The saddest part about this argument between the old guard and the new guard is that it plays out in the public sphere and, in doing so, employs athletic-sized egos that don’t bend or give in. There’s nothing to talk about. We have different perceptions and different views on it, clearly. So the thing that I’m trying to do always, what I’ve been trying to do, is try to educate our youth going forward, no matter what color skin you are—be it African American or white or whatever the case may be. Just try to talk about having a bright future and how to help kids going forward and progress as a society as a whole. Brown and Bryant. Two giants in their sports. Two different views. Both winning in life. Meanwhile, the only losers are the young black men across the country who won’t get the opportunity to see two black men come together for the sake of a bigger prize.